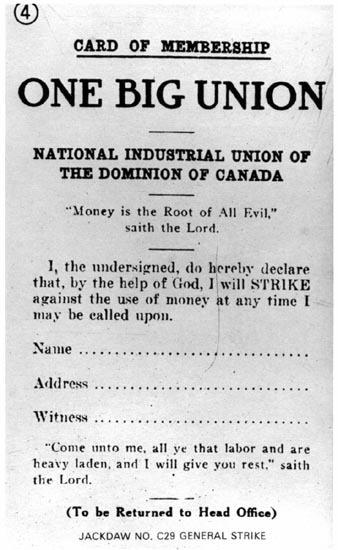 An article by David Jay Bercuson on the radical Canadian 'One Big Union' and its efforts to organize in Washington state (U.S.). Juan is killin it on the evolution-of-trade,industrial&revolution-unions-in-the-U.S. uploads! Just trying to get rid of stuff I've had on my computer for a while. I still have quite a bit more. I dig this group. They organized struggles on a class basis, rather than on the more narrow industrial basis of the IWW. After influencing the 5-week Winnipeg General Strike in 1919 organizers came down the West Coast -- at least as far as Oakland. CORRECTION: According to Art Almeida's new book Wobblies in San Pedro, OBU militants made it as far south as Los Angeles Harbor from Canada in the aftermath of the repression of the Winnipeg General Strike. The same had happened just prior with Wobblies escaping the crushing of the General Strike in Seattle. Huh, I'd have to read about OBU more, but I was under the impression that they often fell along craft lines, despite their efforts. Bercuson long ago became a pillar of the establishment. He once complained publicly that it was unfair that unemployment insurance premiums were being deducted from his pay cheque since he is a tenured professor who would never have a need for this insurance. Bercuson is pretty right wing and his histories of the OBU lazy and skewed. The OBU maintained a Unit/Local in the Bay Area until the early 1930s. Juan, I have a bunch more material, contact me personally. If the image is indeed a facsimile of the OBU membership card, i am surprised by the religious quotations and religious oath used on it . Certainly shows contrary to the article assertions that the SPC influenced OBU-ers did drop their marxist materialism to envelop all workers and were not as sectarian as made out. , but I was under the impression that they often fell along craft lines, despite their efforts. I think craft nor industrial lines as did the IWW but the IWW organised geographically. That's way weird. I've read a lot about the OBU and they always seemed pretty solid marxian/rationalists, reprints of books on evolution, etc. I'll check and try to find some more info. I can't remember where I found this image, but I took it as sarcastic, in the same manner the IWW was at the time.